The new director of comms for the Church of England wants it to be more proactive in its approach, reports Hannah Crown. Thirteen weeks into the job, Arun Arora witnessed the Church of England reach its 'nadir' - a vote that rejected the long-awaited inauguration of women bishops. It may have been narrowly lost, but condemnation was widespread. Media reaction was a mix of baffled and scathing. The new Archbishop of Canterbury Justin Welby called it a 'very grim day' and his predecessor Rowan Williams said the Church had lost 'credibility'. The erudite solicitor-turned-priest-turned-comms professional affirms: 'This was a vote against legislation, not a vote against women bishops. The majority of the Church of England is sold on women bishops.' He says the Church 'might have to look at some of its structures' in a reference to the voting system in the Synod that saw a minority of the laity effectively block the changes. So what of the comms response? There was no plan as such, he says. He wants to portray the Church as a force for good at a local level, and says he set up a 1,500-word article in The Sunday Telegraph Weekend supplement following the vote on good deeds at dioceses around the country, while an internal comms operation is informally taking place via bishops talking to their parishioners about what happened. Arora is less forthcoming about the next potential storm - the emotive issue of the Church's position on gay marriage. He points out 'there are a lot of people in the Church who support it' and that the Church will be submitting a paper in January as part of the Government's consultation on it, but is keener to engage on other issues. Arora started in his new role in September, when his predecessor Peter Crumpler left to train for ordination as a priest. Arora has no desire to become part of the story, but he generated his fair share of column inches before taking up his post, with The New Statesman calling him the Archbishop of York John Sentamu's 'bulldog'. 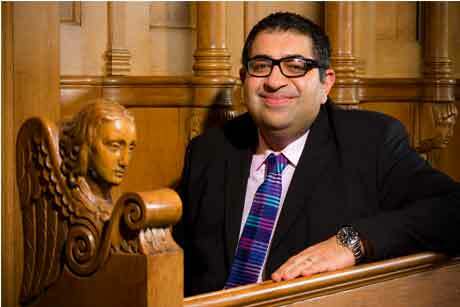 Much of the media attention stemmed from a blog Arora wrote that claimed elements within the Church and media had 'besmirched' the Archbishop's reputation, which was indicative of 'the naked racism that still bubbles under the surface in our society, and is exposed when a black man is in line to break the chains of history'. The son of a Hindu mother and a Sikh father, who died when he was eight, Arora was an active anti-racism campaigner in his youth, organising one of Birmingham's first anti-racism conferences in 1993. One of his most vivid experiences of dealing with the issue was as a curate in Harrogate in 2009, when the BNP's Nick Griffin and Andrew Brons won Yorkshire and Humberside seats in the European Parliamentary elections. But he says, though 'two facists had just been elected' he talked about how 'one has a duty to love them into submission'. Instead, he ventured into employment law, working for trade unions and fighting for the rights of people against corporations. There are more hints of his relish for battle when he talks about 'militant secularists', such as Richard Dawkins. So does Arora's arrival herald the start of a more proactive approach to CofE comms? 'Proactive comms is something we are looking to do, but it doesn't mean going around Bible-bashing or hitting people over the head,' he acknowledges. The 40-year-old certainly has the fire - and compassion - in his belly to take on the challenge. There were two: landing a training contract at Thompsons Solicitors, following hundreds of rejections, and being appointed to the comms role for the Diocese of Birmingham. John Sentamu, the Archbishop of York. He is an instinctive communicator and I had the privilege of working for him in Birmingham and York. Also, John Barton, who was the national broadcasting officer for the CofE. From him, I received wisdom, humour and lessons in grammar. Passion and authenticity can't be taught or faked, so don't go for the money - go where your interests are and where you can make a difference.